VANCOUVER, BRITISH COLUMBIA--(Marketwired - Feb. 9, 2017) - Skyharbour Resources Ltd. (TSX VENTURE:SYH)(OTCQB:SYHBF)(FRANKFURT:SC1P) (the "Company") is pleased to announce that it has now commenced its planned 3,500 metre drill program on its flagship Moore Lake Uranium Project located on the east side of the Athabasca Basin. The program will continue through February into late March / early April with the majority of the drilling planned on and along strike of the high grade Maverick Zone which is land-based and accessible year round. Jordan Trimble, President and CEO of Skyharbour Resources, states: "The commencement of our first diamond drill program at our flagship Moore Lake Uranium Project is a key milestone for Skyharbour and its shareholders. Uranium properties with the pedigree and potential of Moore Lake are rare with historical high grade mineralized results including 4.03% eU3O8 over 10 metres at the Maverick Zone as well as several shallow exploration targets that offer the potential to generate additional discoveries. 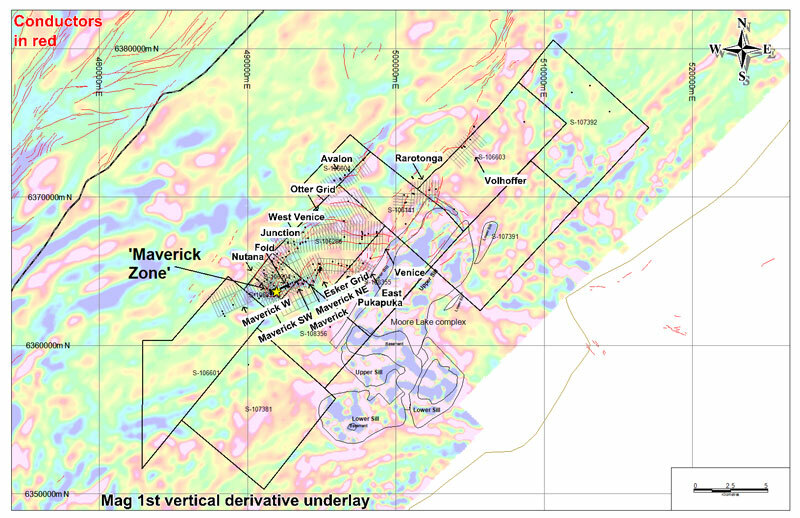 The target areas in and around the Maverick Zone that we are drill testing with this initial 3,500 metre program provide strong discovery potential as we look to value-add the project using a systemic and proven exploration methodology. The Company is well funded to complete this drill program and will provide updates as results become available." In June 2016, Skyharbour secured an option to purchase Denison Mine's Moore Lake project, on the southeastern side of the Athabasca Basin, in northern Saskatchewan. The project consists of 12 contiguous claims totaling 35,705 hectares located 42 kilometres northeast of the Key Lake mill, approx. 20 kilometres east of Denison's Wheeler River project, and 39 kilometres south of Cameco's McArthur River mine. Unconformity style uranium mineralization was discovered on the Moore Lake project at the Maverick Zone in April 2001. Historical drilling highlights include 4.03% eU3O8 over 10 metres (including 1.4 metres at 20% eU3O8) starting at a depth of 265 metres in hole ML-61. In addition to the Maverick Zone, the project hosts other mineralized targets with strong discovery potential which the Company plans to test with future drill programs. The project is accessible via winter and ice roads which simplifies logistics and lowers costs. 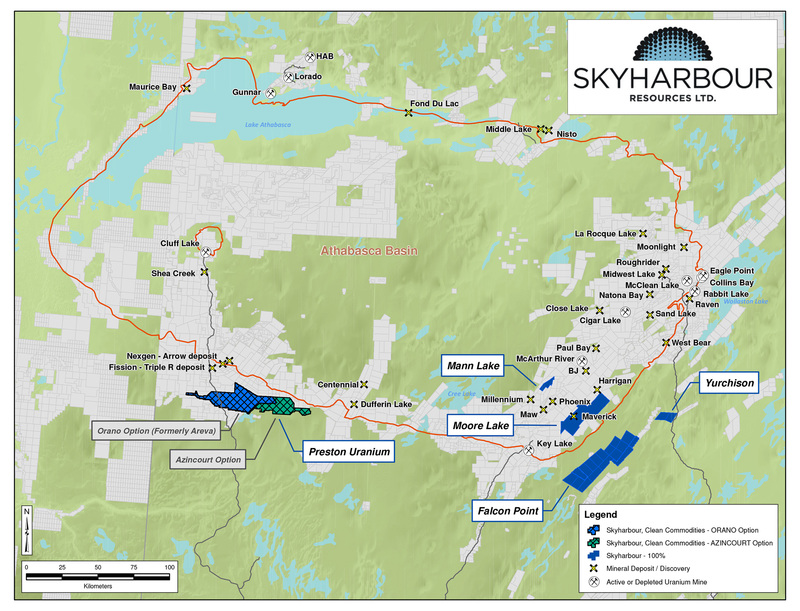 Skyharbour has received all of the required permits for this planned 3,500 diamond metre drill program now underway at the Moore Lake Project which will consist of 10 to 13 drill holes ranging in depth from 200 metres to 400 metres. The majority of the drilling will test and look to expand the Maverick Zone with targets both in the underlying basement rock as well as along strike of the known high grade, main Maverick mineralized lens. Additionally, several drill holes will test the 527 and the 525 Zones which are located along the Maverick corridor approx. 500 metres and 1,500 metres respectively, east of the main Maverick mineralized lens. Skyharbour holds an extensive portfolio of uranium and thorium exploration projects in Canada's Athabasca Basin and is well positioned to benefit from improving uranium market fundamentals with five drill-ready projects. In July 2016, Skyharbour acquired an option from Denison Mines to acquire 100% of the Moore Lake Uranium Project which is located 20 kilometres east of Denison's Wheeler River project and 39 kilometres south of Cameco's McArthur River uranium mine. 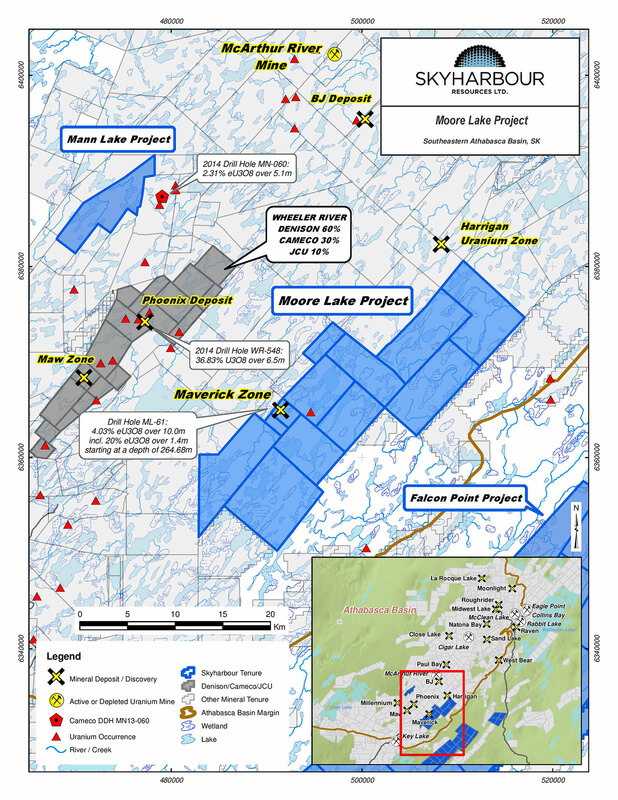 Moore Lake is an advanced stage uranium exploration property with over $30 million in historical exploration, 370 diamond drill holes, and a high-grade uranium zone known as the Maverick Zone with drill results including 4.03% eU3O8 over 10 metres at a vertical depth of 265 metres. The Company owns a 100% interest in the Falcon Point (formerly Way Lake) Uranium Project on the eastern perimeter of the Basin which hosts an NI 43-101 inferred resource totaling 7.0 million pounds of U3O8 at 0.03% and 5.3 million pounds of ThO2 at 0.023%. The project also hosts a high-grade surface showing with up to 68% U3O8 in grab samples from a massive pitchblende vein, the source of which has yet to be discovered. Skyharbour also has a 50% interest in the large, geologically prospective Preston Uranium Project proximal to Fission Uranium's Triple R deposit as well as NexGen Energy's Arrow deposit. The Company's 100% owned Mann Lake Uranium project on the east side of the Basin is strategically located adjacent to the Mann Lake Joint Venture operated by Cameco with partners Denison Mines and AREVA, where high-grade uranium mineralization was recently discovered. Skyharbour's goal is to maximize shareholder value through new mineral discoveries, committed long-term partnerships, and the advancement of exploration projects in geopolitically favourable jurisdictions.